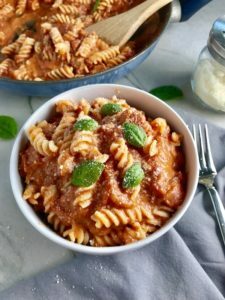 This Luscious Tomato Cream Sauce Pasta is a recipe that I have been cooking for years, but was never really a recipe in my mind, just my go-to dish for when I hadn’t really planned anything else. 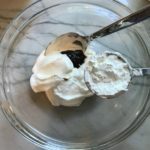 But the taste is anything but an afterthought…it’s seriously amazing – and amazingly simple!! 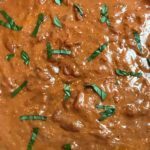 I describe it as luscious because the tomatoes, which are still slightly chunky become this thick, creamy, smooth, velvety, and flavorful sauce. I warn you, you will want to lock the doors, grab a spoon, and eat this sauce straight from the pan (not because I’ve done that or anything😳). 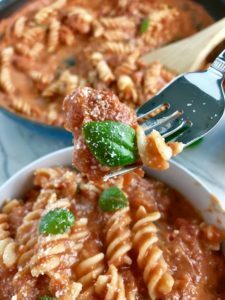 But I recommend that you mix it with a Rotini or Fusilli pasta that can hold all of that luscious sauce in the spiral grooves and enjoy it with your family. Honestly, this recipe is so simple that there really is very little to prep ahead. But, every little bit helps, right? So, here are the steps you can do the day(s) in advance and store in the fridge. 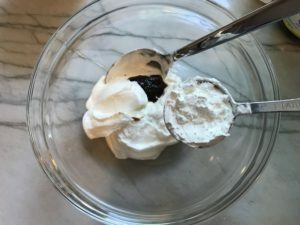 Into a small bowl, add the sour cream, the Vegetable Base, and cornstarch and mix to combine. Seal the bowl with plastic wrap or cover with lid and store in the fridge. Make the Rotini or Fusilli pasta and store in a storage bag in the fridge. 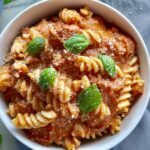 I use Gluten-Free Rotini pasta in this dish, but use your favorite! 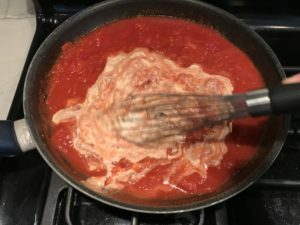 Place the 5 prepped ingredients on a pan in the fridge to create your Kit: garlic, tomatoes, sour cream mixture, and pasta. Now comes the EASIEST dinner you’ve ever put together (not counting delivery;)). Saute the garlic in a preheated large skillet, add the tomatoes and cook for several minutes. 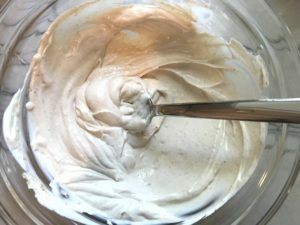 Next whisk in the sour cream, vegetable base, and cornstarch mixture. Cook for another 5 minutes until the sauce thickens and starts to bubble (lightly cover with aluminum foil if it starts to splatter). Last, add in the basil and the pasta and stir to completely combine. Serve on a plate or in a bowl and garnish with basil and parmesan cheese (if you like)! 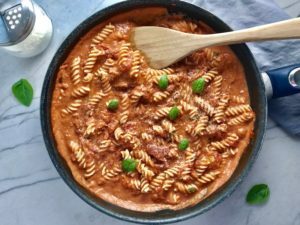 This Luscious Tomato Cream Sauce Pasta tastes amazing - and it's amazingly simple to make!! 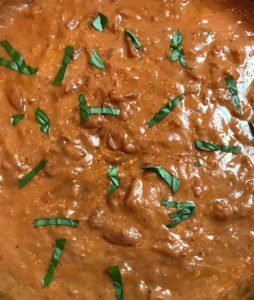 I describe it as luscious because the tomatoes, which are still slightly chunky become this thick, creamy, smooth, velvety, and flavorful sauce. 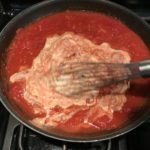 The combination of the San Marzano tomatoes and sour cream takes a simple red sauce to a perfect pink heavenly cream sauce! 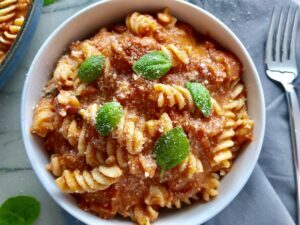 Make the Fusilli pasta and store in a storage bag in the fridge. Add the garlic to a preheated large skillet with a teaspoon of Extra Virgin Olive Oil. Saute the garlic for 2 minutes on medium to low heat stirring it around so it doesn't burn. Next add the tomatoes and the tomato sauce that you have crushed. If you haven't crushed them yet, do so right as you add them to the pan! Slowly whisk in the sour cream mixture to the tomatoes in the skillet. Cook for another 5 minutes until the sauce thickens and starts to bubble (lightly cover with aluminum foil if it starts to splatter). Add salt and pepper, mix, then add more to taste. Stir in the basil, leaving a little for garnish. 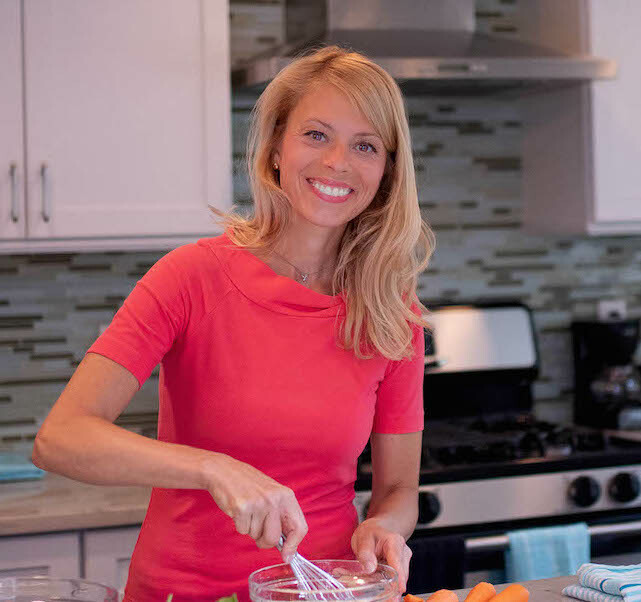 If you cooked the pasta ahead of time and it is cold, put it in a strainer and run warm water over it to soften and separate it. 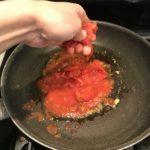 Stir the cooked pasta into the tomato sauce. Serve in a bowl or plate and garnish with basil and grated parmesan cheese (if you like). Enjoy!